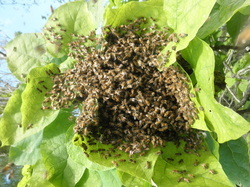 See a Swarm of bees? Call one of us! For those in the city and counties near Richmond, Virginia, if you see a swarm of bees (typically a large number of bees hanging on a limb or other area where you have not seen them before), please contact the East Richmond Beekeeper’s Association. For a list of members who collect swarms and/or remove honey bees from structures, see the chart below. What is a swarm anyways? When honeybees get to crowded in their hive, sometimes the queen will decide its time too "move out" with some of the members of the hive. When they are looking for a new place to live, they will all stay as close to the queen as possible to keep her safe.